Information apply's to the 2007, 2008, 2009, 2010, 2011 and 2012 Silverado 1500's. Find reviews from top accessories for the 2007, 2008, 2009, 2010, 2011 and 2012 Chevy Silverado 1500. Accessorize your new Chevy Silverado with aftermarket add-ons from suspension lifts to HID headlights. Your new Chevy Silverado is a dynamite platform with loads of dealer accessories and aftermarket modifications just beggin' for a place on your truck. The aftermarket accessories shown below have been chosen for use on this 2011 project Chevy Silverado. We started with a set of V-Tec 326 Off-Road Wheels featuring a 6 spoke design with a Ultra Bright Chrome finish that's easy to clean. The V-TEC brand of custom wheels includes the ultra bright custom chrome as well as a new line of off road wheel styles specifically built for today's truck and SUV's. Many other finishes are available including the popular Phantom Black finish. We chose the new leveling kit from ReadyLift for our 2011 Chevy Silverado. This leveling kit is the most cost-effective and time-efficient way to bring the front of your Silverado up level with the back by lifting the front 2.25 inches. Measurements confirmed that the kit did indeed lift the front by the rated amount. Read about our installation and results from installing the ReadyLift Leveling Kit. Air Lift Air Springs Adjustable Load Support. Now wee needed a way to compensate for hauling heavy loads or pulling a trailer with our Chevy after lifting the front just a bit higher then the rear. As will all our trucks, we now are ready to install the Air Lift Suspension Bags to take total control of every load we carry. Air Lift Air Springs Adjustable Load Support keeps our headlights pointing on the road and not in the eyes of oncoming traffic. Adding the Sprayed In Bed Liner from Line-X to the 2011 Chevy Silverado. Adding the new top coating really made the difference in the looks of our new Line-X Spray In Bed liner. Borla Cat Back Performance Exhaust. Currently on order and to be installed by Dave's Automotive in Cheney WA. around May 25, 2011, Borla Stainless Steel Cat-Back System Part# 140341. Advertised Power Gains: 15% Horsepower Increase; between 35 and 45 h.p. gains are normal. The exhaust will be complemented by a Airaid Cold Air Intake system. Stop back and see how the parts fit and change this already fine piece of American made machinery. Award-winning SuperMAXX header systems from Dynatech incorporate the latest in racing exhaust technology for increased horsepower and torque. Aftermarket exhaust headers like these long tube pipes from Dynatech are a great way to add low and mid range power to any truck. Direct-fit Dynatech SuperMaxx headers, part # 115141300, include a factory-style O2 sensor and are fully ODB-II compatible. Claiming to increase both horsepower and torque, Airaid Cold Air Intake Systems are computer designed to give your engine maximum air flow which in theory should translate into that increase in horsepower and torque just as advertised. Installation was a snap for the crew at Dave's Auto in Cheney WA. and the power difference was immediately noted. Read Airaid Cold Air Intake for more on the installation of this system. Advertised Power Gains: 12 to 18 h.p. Add that extra level of protection from rock chips and road debris. The Bushwacker Extend-a-Fender is designed to accommodate most oversized wheel and tire packages and is a great complement to any leveling or lift kits you choose to install. Bushwacker Extend-a-Fenders are made from the tough ABS material to offer maximum durability and flexibility for your truck. We will be installing a set of WinJet 2007-2011 Chevy Silverado LED Tail Lights that we purchased through Amazon. We have the lights in hand and will be installing them in the next few days. Order a set of WinJet 2007-2011 Chevy Silverado LED Tail Lights - (Chrome/Clear) for your truck from Amazon.com. Vision PRO Gen II 5000K H11 Xenon HID Xenon Conversion Kit have been installed in the low beam headlights to check out the completeness of the kit along with the color of the 5000K HID's for our 2011 Silverado. The Vision PRO Gen II 5000K 9005 High Beam Headlights HID Conversion Kit is now on order to complete a total transformation from the stock headlights to HID's. Cooper Discoverer A/T3 Tires in LT285/70/17E. For a daily driver, high traction tires like the Cooper Discoverer SST is just not necessary. 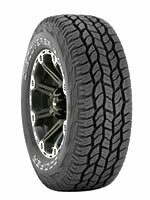 A good all-season/all-terrain tire like the Cooper Discoverer ST Maxx or the Cooper Discoverer A/T3 offers some important advantages over the SST when the vast majority of the driving will be on paved roads. Seeing that we will be driving the Silverado to Alaska, we have opted for a set of Cooper Discoverer A/T3 in LT285/70/17E to handle the duties of lots of loose gravel, a little mud and hard-packed crushed rock and the possibility of snow and ice in the higher elevations of Northern B.C. and the Yukon. The folks at Dave's Automotive in Cheney, WA have fitted us with a set of these tires in preparation of the trip over the renowned Alaska Highway. Cooper STMAXX Tires in LT285/70/17E. Looking for a little more traction or that aggressive look for your Silverado? The Cooper STMAXX may just be the tire for you. This new tire sports an appeal to off road enthusiasts that want to tackle the sharp rocks, dig in the gooey mud or challenge the snows while exploring for a new hunting spot in the deep desolate outdoors. The Cooper Discoverer S/TMAXX features Cooper's proven and reliable 3-ply “Armor-Tek3®” carcass construction combined with a new, proprietary cut and chip resistant tread compound. This is the tire for those looking for sure footed traction both on and off the road making it a viable alternative for our 2011 Silverado test truck. Studdable tires are popular choices for winter driving and the Discoverer S/TMAXX are ready for the winter with plenty of pins to make this tire even a better choice for mud, snow and icy driving conditions. All the above changes have facilitated the need for a larger, more aggressive yet street drivable tire. After many hours of research and discussions with retailers and owners we have come down to the Cooper Discoverer AT3 or the Cooper Discoverer STT Tires in LT285/70/17. Either of these tires should fill the wheel wells and still offer decent gas mileage from the new 3.73 gearing. Matching Truck Canopy and Tonneau Covers. Our custom Range Rider Cruiser series truck canopy has been painted a matching Imperial Blue Metallic by Dave's Automotive in Cheney. With the new matching paint completed, the custom Chevy canopy is fitted to our Silverado and secured for the trip. Now everything will be safe and dry under the cab high Range Rider Cruiser canopy. A perfect color match in a two part urethane paint makes this canopy look factory installed.